Vivianna Karamanis's chewy, spicy, not-too-sweet logs make a fun vegan hors d'oeuvre. Far from being a new-fangled vegan substitute, this Greek fig "salami" is a first cousin to panforte de siena, a dense, peppery, dried fig loaf traditional in Italy since the 13th century. Hovering between sweet and savory, these chewy logs of deliciousness can sub in for jam or chutney on bread, toast, or crackers, with nuts or dessert, and definitely with wine. Fruity and spicy, they delight the palate both before and after dinner. 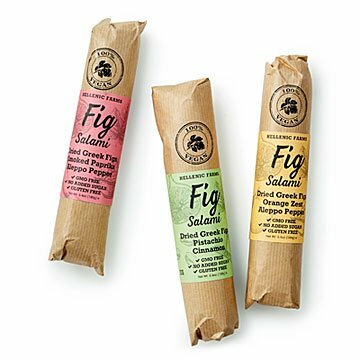 Each flavor contains only simple, whole ingredients: figs, aleppo pepper, orange zest, pistachios, cinnamon, and smoked paprika. Ingeniously packaged like meat salami, easy to slice and serve, they make a healthy yet fun snack, hostess gift, or offering to your favorite vegan. Made in Greece. Vivianna Karamanis comes from a food family with Greek roots. She grew up in New Jersey, the daughter of a wholesale seafood distributor and restaurateur who took his family to Greece every summer. Her paternal grandfather ran the local bakaliko (little market) on the Greek island of Chios, and her maternal grandfather was a mastic farmer. She always returned home from her Greek summer vacations with tins of locally produced products. She decided to follow her heart to Athens, and it was then that she began to notice beautifully packaged, high-quality Greek foods. She tracked down some of their local producers, and decided to start a business to bring their unforgettable flavors home to the US. Three 6.4 oz fig "salamis"
Store in a cool, dry place. Refrigeration is not necessary. I bought these for stocking stuffers. The recipients threw them out. Taste is terrible and gritty. Not all flavors are winners. I wasn't with my dad to try out these salamis, but he was very clear in his preference for one flavor over the others, stating that he found the paprika and pepper flavors repulsive. However, he loved the walnut! If I could order just that flavor again, I would. The texture and appearance of these is right on point, but they do not taste anything like dried sausages. They are pretty sweet, they taste like compressed, dried figs. Maybe if they were saltier? That being said, they are delicious in their own right and fill a niche in your vegan/vegetarian cheese plate! I definitely recommend them, just not as a 1:1 substitute for meat. I will say it's an interesting concept but it missed the mark. The seasoning is mild and the most prominent flavor was sweet fig. Wouldn't purchase again. Would buy for myself again, and as a gift. Like the salamis. Like to try the unusual. This is a great substitute for meat salamis, healthwise and even better tasting. Eat slices on pita chips, but want to try something else. Would have welcomed suggestions for serving. Yum.